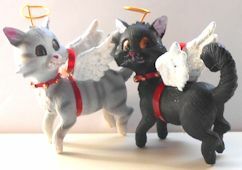 These resin cat angel ornaments are 3" high x 3" wide x 1" deep. They can stand in a holiday display or hang on a Christmas tree. Red ribbon loop attached for hanging. Choose either grey or black.